A doctor guides robotic arms to do surgery on the heart. The surgery is done through several tiny keyhole incisions. Robot-assisted atrial septal defect repair may be used to treat a hole between the upper chambers of the heart that does not close properly during fetal development. Robot-assisted biventricular pacemaker lead placement may be used to treat heart failure due to atrial fibrillation, which is an irregular heart rhythm in the upper chambers of the heart. 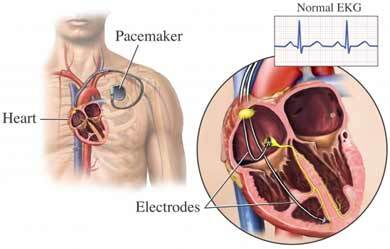 Pacemaker leads implanted in heart to maintain normal rhythm. While sitting at a console near the operating table, the doctor will use lenses to look at a magnified 3D image of the inside of the chest. Another doctor will stay by the operating table and adjust the camera and instruments. The robotic arms and tools will be guided by movements of the surgeon. After the instruments are removed, incisions will be closed with sutures or staples. This procedure is done in a hospital setting. The usual length of stay depends on the procedure you had done. Your doctor may need to keep you longer if you have any problems. Enroll in a cardiac rehabilitation program. Follow your doctor's instructions on caring for the wound to prevent infection. About minimally invasive and robotic cardiac surgery. Columbia University Medical Center, Department of Surgery website. Available at: http://www.columbiasurgery.org/conditions-and-treatments/minimally-invasive-and-robotic-surgery. Accessed March 27, 2018.